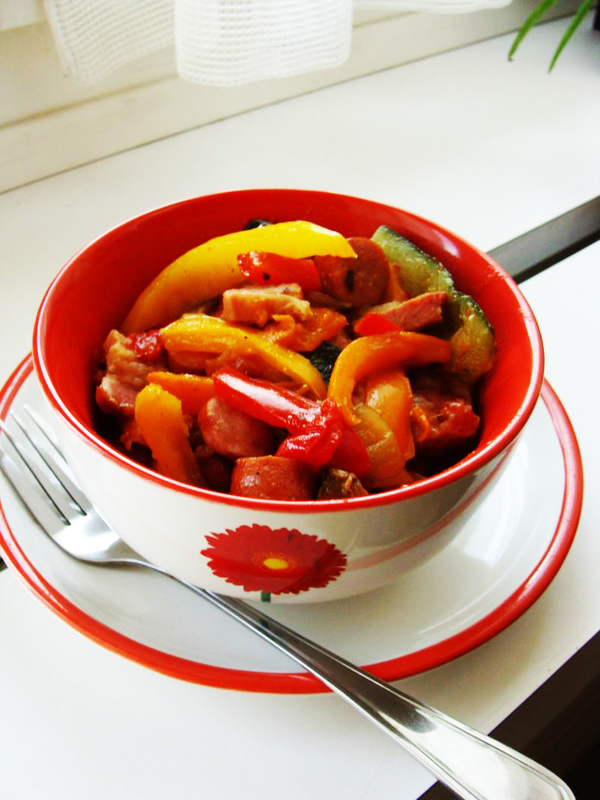 Lecho is an originally Hungarian dish consisting of peppers, sausage, bacon and onion and sometimes also tomatoes. I learnt how to make lecho at home. My mom is making it every now and then and I really like it. Last Sunday was full of spring vibe and I decided that it’s time for vegetables. And so I committed lecho. Enjoy! Cut sausage and bacon in little pieces and fry them till they release some fat. Add onion, cover the pot and let it steam and soften for a few minutes. Add garlic and the rest of the chopped vegetables (minus parsley), spices and boil on a medium heat until vegetables are firm (or soft, as you prefer) and release some of their juices. Uncover in the end to get rid of some excessive liquid. In the end of cooking, add parsley for even more flavour. Parsley gives this dish an interesting taste.